Pyxie is not just a sailing vessel. She is my castle, my cocoon and my magic carpet. She is where I find home. Wherever and whatever that is. 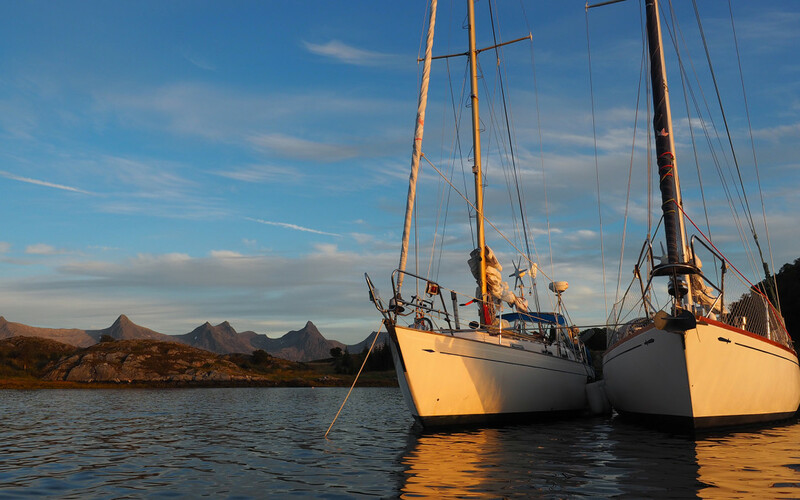 The joy of living on a boat is not exclusively about the sailing. Sure, it is a lot about the sailing. A lotta lot. I am easily afflicted by harbour sickness. Having the mooring lines attached for too long makes both me and Pyxie antsy. So some days, when I don’t have the time or the wind to sail far, we putter off somewhere close, simply to drop anchor. Perhaps I’ll curl up in front of the wood stove, just listening to the rain and reading a book. Or bring a sleeping bag on deck to watch the stars. Even though I don’t live in a house, sailboat living allows me to be a total homebody, bake bread, do office work or practice yoga – all while being on a continuous journey. With Pyxie I can cover great distances, though not at speed. I call it snailing. I’ve got my house on my back, moving slowly around the world. She’s a self-sustained unit, and I can live off the grid for extended periods of time. With a bit of wind and sun my batteries charge up, a tank full of fresh water lasts a long time and I can store (and gather) enough food to keep me full for ages. What more could I ask for? A companion. Which I have. I’m not really sure who owns who, the cat or the human. The feline first mate is called Poesi, and she has been my companion for 18 years now. She has seen me through my best and through my worst, breakups and all. Like an old honey badger, she doesn’t give a fudge if I mess up. Actually, she’s asleep on my lap as I write this. Although she’s fallen overboard once (while moored, thank goodness) and had her whiskers torched by my clumsy stoking of the wood stove, her nine lives are still going strong. And although she’s peed on my duvet a few times, especially when we’ve sailed upwind in choppy seas, she loves her life on the boat just about as much as I do. I can tell. We’ve been together for half of my life, after all. She’s more at ease on the boat than in any city apartment we’ve lived in, even the one where she had a private backyard in Paris. She and me alike. I sometimes tell our sailing stories they way I imagine she would. You can check one out here, or follow us on instagram. Should I give her an account of her own, I wonder? She’s way more interesting than me, anyway. Right now, my heart is in the north. I set sail from Oslo last summer, and took my own, sweet time exploring the coast of Norway. I needed to learn how to sail alone, and there could be no better way of doing it than … doing it. I also wanted to explore my own concept of home. Now I’ve sailed up to Lofoten, north of the Arctic Cirle. I’m moored not far from the fjord and farm where I grew up, Grunnførfjord. Fjorden. The Fjord. This is the place where I know the names of every valley, rock and creek, where I know the best spots for chanterelles, cloudberries and mussels, where I spent endless hours playing witch and building tree houses, where I’ve broken in horses and practiced sheep midwifery. This is home. A piece of my heart will always be rooted here. Or, rather, this place will always be rooted in my heart, wherever I go. Not least because of the crazy, wonderful people I call my family. I wouldn’t have traded the love, space and magnificent nature I grew up in the midst of for all the ameneties, gadgets and extracurricular activities in the world. No, Mother, I did not grow up poor. I am forever grateful for all the riches you have given me. Finishing off this ode to the boat, the cat and the people I love, I’d like to make a point that hopefully goes beyond my own, little world. To use hopelessly grandiose words that still fall short: Home is in the serendipitous, magic moments that comprise the here and now. In the good, the bad and the in between. Perhaps this sailing thing is just about making it easier to notice life as it unfolds. When the wind is howling in the rigging, and the seas build, I notice being alive all the more because death can be just a few knots away. When my morning view changes daily I see the landscape with newborn eyes. When my boat neighbour is 86 and still sailing solo it gives me immediate perspective. And when a new friendship in a port makes my heart sing, I can change my planned route in order to share aurora nights, secret anchorages, powertools, porpoise spottings, coffee mugs and sweet silence. I can just go with what life brings. And then sail on, with more songs and more friends around the next corner. Or the solitude that lies only a couple of nautical miles out to sea, at all times. This is what snailing is all about, for me. It is the source of continuous, magic moments. For you, the source might be something different entirely. Please, for the love of chocolate, can you do me the favour of listening in, and following the hunch – or the song – that resides inside of you? Go home. That’s where it is. Lovely ideas. I love the idea of Snailing! I’m gonna do that and keep all my moments pure.